There are a lot of recipes for chocolate chip cookies out there, and I’m going to go ahead and add another to the mix. I think these are perfect chocolate chip cookies, let me make my case for you. Soft in the middle, but chewy on the edges. Perfect texture! Semi-sweet chocolate chips AND milk chocolate chips. Best of both worlds. You don’t have to wait for butter to soften, or cookie dough to chill. You can whip these up quickly! These chocolate chip cookies are big! 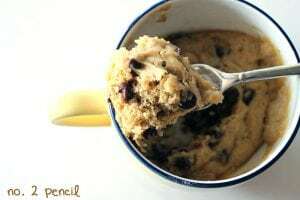 Three tablespoons of cookie dough. 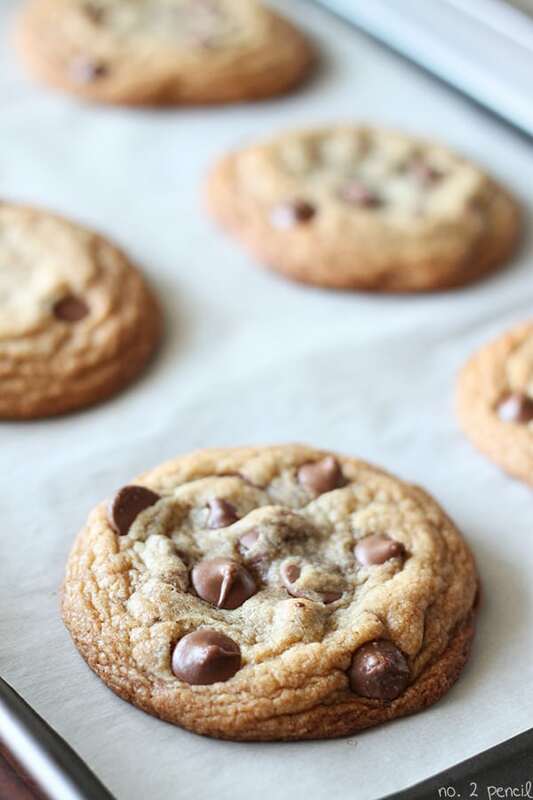 Topping the cookie dough with additional chocolate chips before baking is the secret to making these chocolate chip cookies so pretty! Perfect for gift giving. I’ve adapted these from the Cooks Illustrated Perfect Chocolate Chip Cookie recipe. 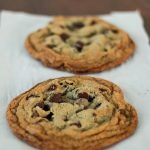 I absoluetly love that recipe, but my kids prefer a more traditional flavor profile, and sometimes so do I. I took what I loved about the Cooks Illustrated recipe and adapted it a little to make the perfect chocolate chip cookies for our family. Instead of browned butter, I used melted butter, one tablespoon less than the original recipe to account for the evaporation of the butter as it browns. I also switched out the dark brown sugar for golden brown sugar because we like the milder taste of the light brown sugar. Several years ago, I noticed that the take and bake cookie dough you can buy at the grocery store has additional chocolate chips on top. 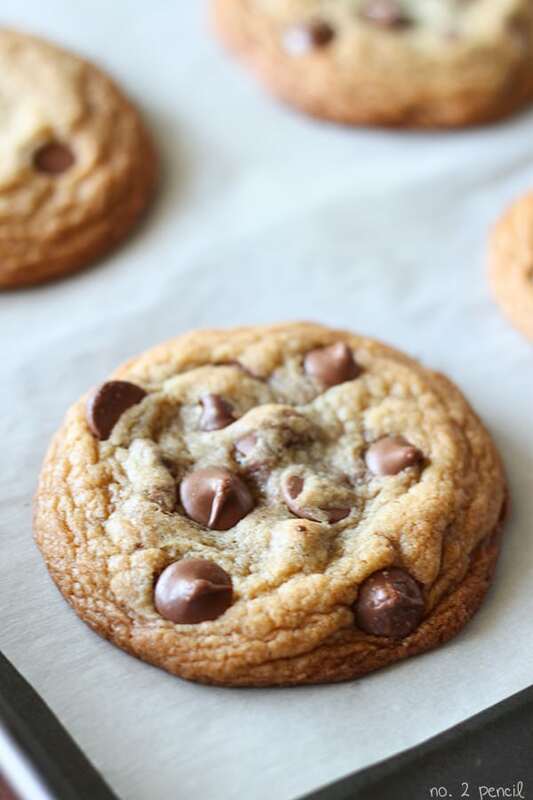 I thought this was really clever and started adding them to my cookies as well, that way the cookie has chocolate chips baked in and chocolate chips on top. 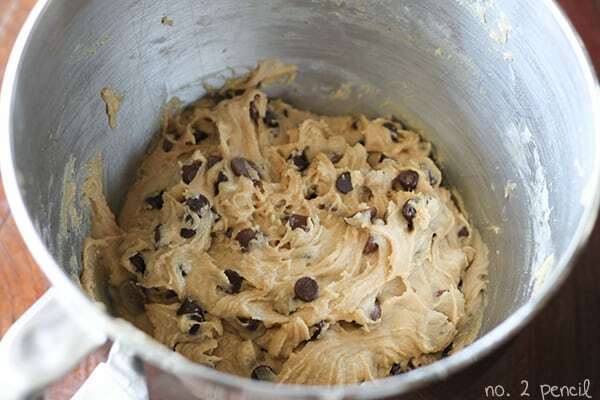 Just press additional chocolate chips into the top of the cookie dough before baking. Start by melting butter and setting butter aside to cool completely. Preheat oven to 375 degrees and line baking sheet with parchment paper. In a medium bowl, whisk together flour and baking soda. In the bowl of a stand mixer with paddle attachment, combine melted and cooled butter, both sugars, vanilla and salt. Beat on medium speed until well combined, about 2 minutes. Add egg and egg yolk, scraping down sides of bowl as necessary. Add in flour mixture and continue mixing until incorporated. Add in chocolate chips and give a final stir. Dough will be soft, but should be firm enough to shape into balls. 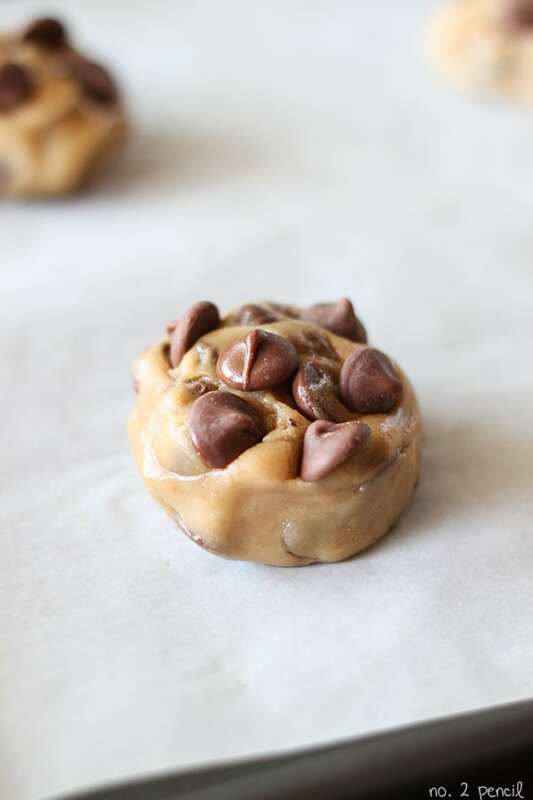 Place cookie dough on baking sheet and top with additional milk chocolate chips. Bake about 9 minutes, just until edges are a light golden brown. Don't over bake as cookie will continue baking as it cools. Make sure butter has cooled completely before using. Warm butter will make cookie dough overly soft. If cookie dough is very soft, let stand for about 10 minutes and it will be easier to handle. You can find all of my cookie recipes here! Love your recipes! 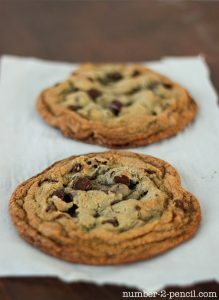 Just wanted to let you know you have an ingredient that may be a typo: “1 cup of semisweet chocolate chip cookies” :). Can’t wait to try this out! Thanks!!! Thank you so much for letting me know, Michelle! I’ve updated the recipe. Nothing like revisiting a classic – these look absolutely delicious! In the ingredients list there is a line saying: “1 cup of semisweet chocolate chip cookies”. I don’t quite understand what it stands for. Cookies? Chocolate Chips? It should read chocolate chips. I’ve updated the recipe. Thank you for the comment! Those are delicious looking/sounding! Perfectly round too… how do you make them so perfectly round? Also, I don’t have parchment on hand, OK to just put on the baking sheet directly? I try and make the dough ball as evenly shaped as possible, if that makes sense! I recommend using parchment paper, but a non stick baking sheet should work as well. That can change the appearance of the cookie, baking time, etc. Let me know how it goes! Hey! I just made these cookies! they rase delicious! BUT when I made them the edges linda flattened out? I don’t know if that makes sense. What could I have done wrong? Maybe too big? I used a table spoon measuring spoon and added a little more. Thanks for the recipe! My first time making cookies from scratch! I’m so glad you made these! Congratulations on making them from scratch! Did you measure out three tablespoons of dough? Did your dough look similar to the picture? Don’t forget to let the butter cool before combining with sugar! If you have a pic, you can email me or tag me on Instagram and I can help you troubleshoot. These are delicious! Loved this recipe. How do you get your cookies to spread out so much? Whenever I bake cookies they stay puffed up and don’t spread out and get crispy. Have you tried this recipe? This recipe uses melted butter which should help your cookies spread a bit! The cookies look delicious! May I know the weight of your large egg with shell? Thank you. O-M-G!!!!! My kids and I just made these chocolate chip cookies and they are perfection!!! Yay! Thank you for taking to time to leave a comment!!! I rarely comment on uh.. stuff. But! This recipe has been my go-to long enough now that I feel you deserve some praise. Amazing, amazing cookies! Every time I make them I’m pleased by the results, and I love how easy it is to change the texture of the finished product depending on how long you 1) cream the butter and sugar or 2) allow the butter to cool. Thanks for the awesome recipe, and God bless! I’m so glad! Thank you for taking the time to comment! That’s great! Thanks for the comment! Your chocolate chip cookie and sweet tea recipes sound great! Thank you for sharing them. I’ll be trying them soon.